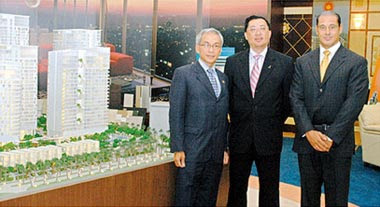 BIGGER PRESENCE: (From right) Silver Coast managing director Shaher Awartani, Capitala acting CEO Heang Fine Wong and SunCon managing director Kwan Foh Kwal pose next to a model of Rihan Heights. Sunway Holdings Bhd has bagged a RM1.8 billion contract to build part of a mixed development project in Abu Dhabi in the United Arab Emirates (UAE). The contract marks its second job in the Middle East as the group seeks to expand abroad. It has already carried out projects in Singapore, India and Trinidad and Tobago. In recent years, Malaysian builders have been expanding overseas as large construction projects become scarce at home. Sunway Holdings' latest project involves works at Rihan Heights, phase one of the Arzanah mixed use integrated development. It will be carried out by the Silver Coast-Sunway Innopave joint venture. The joint venture is a 60:40 partnership between Sunway Innopave Sdn Bhd and the Abu Dhabi-based Silver Coast Construction and Boring LLC. Sunway Innopave is a subsidiary of Sunway Construction Sdn Bhd (SunCon), which in turn is wholly owned by Sunway Holdings. The contract will boost SunCon's order book to about RM3.3 billion and keep the group busy for the next three years. "This project represents another step in Sunway group's globalisation plans under which SunCon is expanding our business interests and construction expertise to more countries," SunCon senior managing director Datuk Tan Kia Loke said. It will also pave the way to more jobs in Abu Dhabi in future. The contract was awarded by Mubadala CapitaLand Real Estate LLC (Capitala). Capitala is a joint-venture company between Mubadala, a business development and investment company in Abu Dhabi, and Singapore's CapitaLand. Mubadala holds the majority 51 per cent stake in Capitala, with the balance held by CapitaLand. Tan said the project, to be led by Sunway Innopave, is strategically located at the gateway on Abu Dhabi island and is part of the fully integrated, mixed use development surrounding Zayed Stadium. "Our contract will involve the construction of five residential towers, a three-level podium, 14 townhouses, a clubhouse and 1,208 parking bays together with associated landscaping, external works and services," he said. SunCon had first ventured into Abu Dhabi to build five towers on Al Reem Island under a group. However, the Arzanah Development-Rihan Heights project is the first that the company is spearheading with a local partner. Tan said the Abu Dhabi government is committed to non-oil economic diversification, which is expected to reach 60 per cent in 2013, through investments and projects in the agriculture, industry, real estate and service sectors. "This provides excellent opportunities for SunCon to further build our brand reputation in the international construction market," he added. Some 60 per cent of the RM3.3 billion order book is from overseas, and 40 per cent of it comes from jobs in the Middle East. Southgate Commercial Centre, an integrated business park developed by the Mah Sing Group Bhd’s wholly-owned subsidiary Jastamax Sdn Bhd, is expected to be completed by 2011. The gross development value of this project is estimated at RM380 million, the company said in a statement today. Southgate, a commercial development project in Kuala Lumpur, has received an overwhelming public response. Mah Sing Group managing director Datuk Seri Leong Hoy Kum said the project is being developed to meet the needs of investors and also companies wanting to own office space in the city. The group is targeting corporate as well as high net worth customers, including professionals, investors and entrepreneurs as Southgate is suitable for different business ventures. KUALA LUMPUR: SBC Corp Bhd aims to launch two mixed development projects with an estimated total gross development value (GDV) of RM800mil by next year in southern Selangor and along Jalan Kuching, Kuala Lumpur. “We estimate our future projects over the next five years, inclusive of these two projects, to have total GDV in excess of RM1bil,” said managing director Sia Teong Heng after the company’s AGM yesterday. Sia Teong Heng (left) and SBC deputy COO Yap Wei Yee at the AGM. SBC’s future projects would be “integrated” with transport links such as the light-rail transit, he added. He cited the success of the company’s PJ Exchange (PJX) office tower project in Petaling Jaya which has attracted requests from corporate clients to replicate the model. “We are currently in talks with a few parties and hope to close some deals by next year,” he said. In view of the softening property sector and rising raw material prices, Sia said SBC planned to overcome that problem by looking out for good locations. “We are working hard to look at some good locations and we believe that long-term investors would invest in good locations,” he said. SBC currently has a total landbank in excess of 700 acres in the Klang Valley and Kota Kinabalu, Sabah. On overseas markets, Sia said the company would continue to explore opportunities in Bangkok but had no immediate plans to go beyond Thailand. GEORGE TOWN: Golden Sands Resort is investing about RM38mil to renovate its 390-room hotel in Batu Ferringhi. The exercise would involve re-doing all the rooms, expanding the coffeehouse, establishing an Italian restaurant and restoring the public spaces. 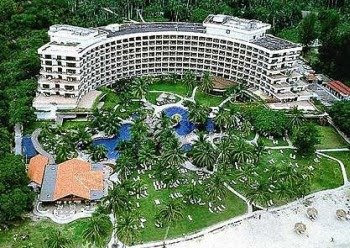 General manager Andrew Whitaker told StarBiz that the hotel would start renovating its rooms in February next year. “Some 14 of the 390 rooms would be converted into suites for families. The other rooms would be given a face-lift to reflect the unique and popular interior decoration themes used in Malaysia,’’ he said. Whitaker said the hotel would not be closed during the renovation period. “We are targeting for the renovation of the rooms to be completed by February 2010,” he said. He said the famous Peppino restaurant would be closed next year and would be replaced with a new RM4.2mil two-storey Italian restaurant by the beach. The present Sigi’s by the Sea restaurant would be removed to make way for the new Italian restaurant, which has yet to be named. “Sigi’s by the Sea will be closed in October 2008, so that construction work can start on the new Italian restaurant, which is scheduled to start operation next May,” he said. Whitaker said the new coffeehouse, currently undergoing renovation, would be reopened soon. “It has been expanded and will feature open cooking areas,” he added. The last time Golden Sands Resort underwent a major renovation was in 1992. KUALA LUMPUR: Mah Sing Group Bhd has won three awards at the Euromoney Liquid Real Estate Awards 2008 event, including the highest honour of the Top Developer Overall Malaysia. In a statement, Mah Sing said the other two awards were the Best Office/Business Developer Malaysia and the Best Mixed-Use Developer Malaysia. The award ceremony will held as a gala dinner in London on Oct 2. Selection of winners is based on surveys and assessment of the real estate sector’s performance and achievement over the past year. “It is a testament to the talent and hard work of our entire organisation, to build a leadership position for Mah Sing and the quest to be a regional, world-class developer,” group managing director and group chief executive Datuk Seri Leong Hoy Kum, said. The company said the top developer award was the single most important category for developers and honoured only one company in each country. “The recognition is attributable to Mah Sing being a consistent provider of high quality and profitable real estate projects,” it added. Mah Sing currently has 14 projects in the Klang Valley, Johor Baru and Penang. HONG KONG: Private equity house CLSA Capital Partners is building a war chest to invest in property in Japan, China and India next year, expecting cheaper deals, and will pour more money into firms it sees as recession-proof. Mosquito coils, ceiling fans and light switches were the type of “things you can touch” that CLSA Capital sought out as it supplied venture capital for Asian manufacturers, and its chairman, Richard Pyvis, said he wanted more of the same. But the firm has about US$100 million to spend on property, freed up by divestments last year, and is looking to raise more money for a region-wide property investment strategy. “We’ve got a war chest but we’re unlikely to deploy it until next year, until real estate prices settle down,” Pyvis told a media briefing in Hong Kong. Pyvis would not give details of planned funds, citing regulatory issues, but saw few difficulties in capital raising for long-term, closed-end funds despite the turmoil in financial markets. He said one of CLSA Capital’s open-ended funds, for investment in clean resources, had “one or two minor" redemptions, but that these had been off-set by new subscriptions. CLSA Capital, which has about US$2.5 billion under management, would look to buy old buildings and refurbish them in Japan, as well as build top-notch office blocks in the biggest cities in India and China. With banks scaling back on loans to the property sector, second-grade buildings in Tokyo have seen a drop in values, sending rental yields up by as much as 100 basis points in the last year. In China, land prices have dropped thanks to government austerity measures, including a clampdown on lending to developers for land purchases and the introduction of various taxes to deter speculation. And Indian property prices have also fallen as much as 25 per cent this year after a surge since 2005, because of overbuilding in some areas and a funding crunch for developers. CLSA Capital, part of the Asian investment banking arm of French lender Credit Agricole, would invest more in companies considered the most immune to a global economic slowdown, Pyvis said. He cited past investments in a Chinese firm that made fire engines, in a manufacturer of eyedrops for conjunctivitis, and in an Indian firm that produced the oil for transformers used on the country’s fast-growing power grid. “There’s no question we’re seeing a slowdown, and there are going to be some sectors that are losers,” he said. Pyvis said he expected a CLSA Capital fund that provides mezzanine financing to flourish after a rise in the cost of debt and share market slides. The fund had found it difficult to source deals, he said, but companies were now keen on mezzanine funding. “Because there’s been a great delineation in the prices of debt and equity, mezzanine is really coming into its own,” he said.